A Caffeinated stream of consciousness…. It’s an understatement to say things have been a little hectic recently…. We’ve had a great summer with the Wheelie Good Coffee cart so far! We started the outdoor season (almost) on time in May – the delays are always with renewing our food safety license, but this year it was a relatively painless process. With Mr. Coffee being home, we were also able to do ‘Wheelie Wednesdays’ – twice as many markets! Woohoo! I also saw the full range of Saskatchewan weather over the last few months, so extreme and so often targetted on Wednesday mornings that I was beginning to take it personally. Once it was so windy I physically couldn’t ride the bike at all. Another day, the head wind was so strong the mile-long ride downtown took me nearly half an hour and I felt I was cycling with the brakes jammed on! Then, I got drenched, twice in heavy rain storms. Heartfelt gratitude goes to Black Fox distillery and Pile of Bones brewing for sheltering me and the cart on those days. (Why am I always rescued by alcohol I wonder?). I have also got severely sunburnt and had to don my silly sun hat, and I started serving cold brew coffee to cope with the 30+ degree days. Unfortunately, these market adventures can’t last the whole season this year. A bit of background: my husband lost his job back in March, and it hit us really badly as I have only been doing Wheelie Good Coffee and staying home with our kids since we closed Dr. Coffee’s Cafe. Money has been exceptionally tight! Finally, Mr. Coffee has been offered a new job. It’s all very exciting and a great opportunity, BUT… it’s in Prince Albert. For a lot of reasons, we are not all going to move up there with him, but he is going to stay during the week and just come home on weekends. This means in turn that Mini and Baby Coffee will be home just with me, and I wouldn’t be able to do the markets with both of them in tow! So, I shall endevour to get to as many Saturday markets as his schedule will allow, but tomorrow (19th) will be my last WheelieWednesday this year. to all our Wheelie Good Coffee customers. Your support this summer has been amazing and we would have been in a much, much worse position without you. With no other source of income, we have literally been using the takings from my 8 hours a week on the market to buy food for all four of us. I honestly don’t know what we would have done without it. When you shop locally, and support small businesses like mine, it really does make a colossal difference to the lives of your neighbours. You may not realise how much people depend on it when you buy coffee from the market rather than from, um, that place with the green aprons, but we do, and we appreciate every single cup you buy! Going forward, I am going to up my roasting game! You can buy my coffee beans online at http://www.wheeliegoodcoffee.biz. Better yet, the amazing ladies at The Junction (2347 McIntyre St) will be carrying a few bags of coffee in their salon and also serving up Wheelie Good Coffee to all their hair clients, which is awesome. I am doing a pop up coffee shop in there soon too. I am also currently hunting for other local stockists (any suggestions would be very welcome!). Watch this space or sign up to my mailing list to stay up to date with all the news and coffee conversation! 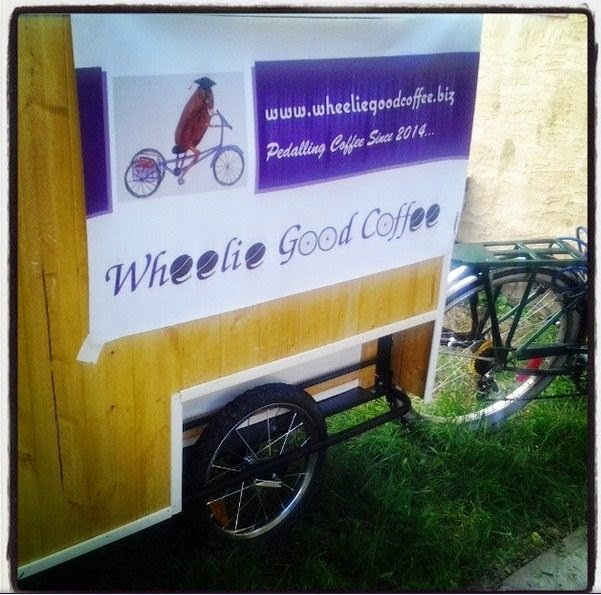 Recently I have been hugely busy, as we finally have the Wheelie Good Coffee cart off the ground! Erm, not literally. 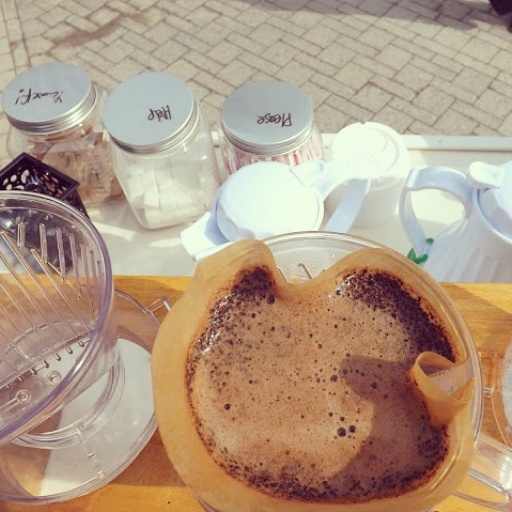 Well, OK there was one incident… anyway, in case you missed my recent post, dear reader, Wheelie Good Coffee is my latest venture: a little cart from which I serve pour over coffees, hooked up to the back of my bike. Originally it was supposed to be attached to the trike, but the trike hitch is still a work-in-progress so for now I am wobbling along on just two wheels with Carl’s help. The aforementioned “off the ground” incident occurred when I overloaded the cart and hit a bump, and then managed to ping the back of wheel of the bike, and myself up in the air and into the curb. Oww. But these minor teething issues aside, all is going phenomenally well. 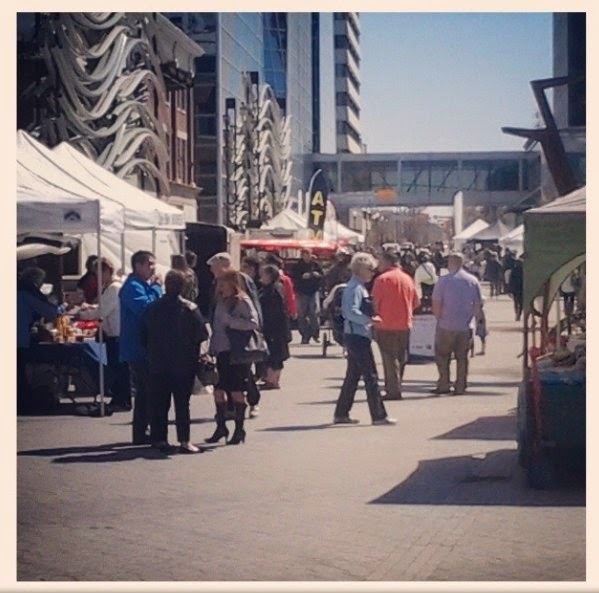 After a wild and windy launch at the Cathedral Village Arts Festival, I am now serving coffee on the Regina Farmers’ Market on Saturdays and as many Wednesdays as the day job will allow. Sadly the market is only on twice a week, and only during the summer, otherwise I’d be out there every day and would quit the day job, but sadly 8 hours a week cannot pay the bills. Fun, busy, successful, confidence boosting Saturdays make coming in to the office on Mondays even worse than usual though. I am not a corporate person. I felt this to be true even before I started this job, but 8 months there has proved it beyond all shadow of a doubt. I loved my university departments, but that is about as close to an office job as I ever want to get. At risk of jinxing things though, the cart is going so well, it inspires me to believe that I am really on to something and could really turn it in to a full time business – given time and hard work. The hard work is not the issue – I am doing this because I enjoy it. Having done something similar before, I know my limits and I’ve learned from my mistakes and experiences with the coffee Ape van and Doctor Coffees Cafe. I am not perhaps approaching this so blindly. The time is an issue though, because I am so impatient! The response to the coffee cart has been such a massive contrast to everything I experienced in Darlington – in the best possible way. Given the circumstances, I still believe I did bloody well in Darlington – but as I said at the time, the little I managed to achieve there, was done despite Darlington council, despite the unhelpfulness and disinterest of the local market officers, and despite the horrible location itself. This time round, the wonders of a new home on a new continent have provided me with amazing amount of support and encouragement and ideas and constructive feedback even before my lovely Carl had built the cart! I cannot thank the Farmers Market crew enough – their support has been invaluable and the market is exceptionally well run and successful. It is also very well attended, and I am rushed off my feet every week, to the point where I don’t even get time to drink my own coffee!! Every week more people visit saying “hey, I follow you on Twitter” or “ooo yay! Coffee on the market!” Or compliment me on the set up (which I redirect to Carl) or the quality of the coffee. On top of that, I am even getting a lot of help from friends at other local businesses – from recommendations for events that could use coffee, to me borrowing a licensed kitchen area with big sinks to sterilize my water tanks in properly from a neighbouring business, to Roca Jacks roasting the coffee and Cuppa T’s selling me tea wholesale. It’s just wonderful, and encouraging enough to make the whole entrepreneurial start-up journey that much less precarious! But this is not just a business blog! What of the coffee, I hear ye cry? I make pourover coffee, that is, pouring hot water very slowly over a coffee dripper lined with filter paper and filled with the best freshly ground coffee, until it drips through a fills the cup underneath. It is far more elaborate and time consuming than making normal drip or percolated coffee, but it makes a much fresher, cleaner cup. Its single serve (though I have four drippers to do four drinks at a time), and because I make it in front of the customers, there’s no issue of keeping it stewing on a hot plate for ages. It’s about as fresh as you can get outside! Also, i get to wave a large, long spouted coffee pot around and make the coffee grounds ‘bloom’ and create steam so it all looks a bit like a mad chemistry experiment. For what is coffee without a bit of magic and theatre? The beans themselves come from Roca Jacks. This makes me very happy indeed. I tried, but I couldn’t manage to rescue the Roca Jacks coffee shop. However, Bill now appears on our doorstep bearing coffee every few weeks, and our house smells deliciously of freshly roasted gooodness all the time. Better yet, I’m going to start retailing the beans in my online store as well, along with all the paraphenalia you need (drippers, coffee socks, mugs etc) to make Wheelie Good Coffee at home! A lot of work awaits me yet, but my coffee-flavoured future looks like a bright happy one from here. Cheers! Lorena insisted on making me porridge with cinnamon this morning, as food for the Cheese since we had such a big day ahead of us. Taxi called for 8.30am to transport me to the 5* hotel for the Conference in Full. No presidents today, sadly, but it did make it much much easier to get in. If I had thought yesterday afternoon was heavy going, I was naive: that was nothing compared to today – sixteen talks, split in to two sections, from 9am to 6pm, some in Spanish, some in Portuguese (the Brazilian continguent, obviously) and one in French (African coffee talk.) 1429 participants. I had to use the little translation headset, and I swear mine was possessed – it had some very, very strange unearthly noises coming from it making it extremely hard to listen to! They had vague notions of improving the quality and developing the infrastructure to help farmers… but never actually suggested the methods for doing this. It wasn’t entirely doom and gloom, India seems to be improving things a little, and the Brazillian rep basically ended up concluding that they would carry on as normal! Outside of producing countries, there were a few talks from consuming countries – mainly facts and figures and pretty graphs of how much coffee Americans drink, and a terrifying statistic that the UK is one of the largest consumers of soluable/instant coffee in the world. Uuuur gh, that’s embarrassing! There was a bizarre but fascinating presentation about the Russian coffee industry – such as it is. Up until 1998, there were two coffee shops in St. Peterburg, and that was it in the entire country. It’s growing, slowly, but it is fascinating, and very difficult to imagine! 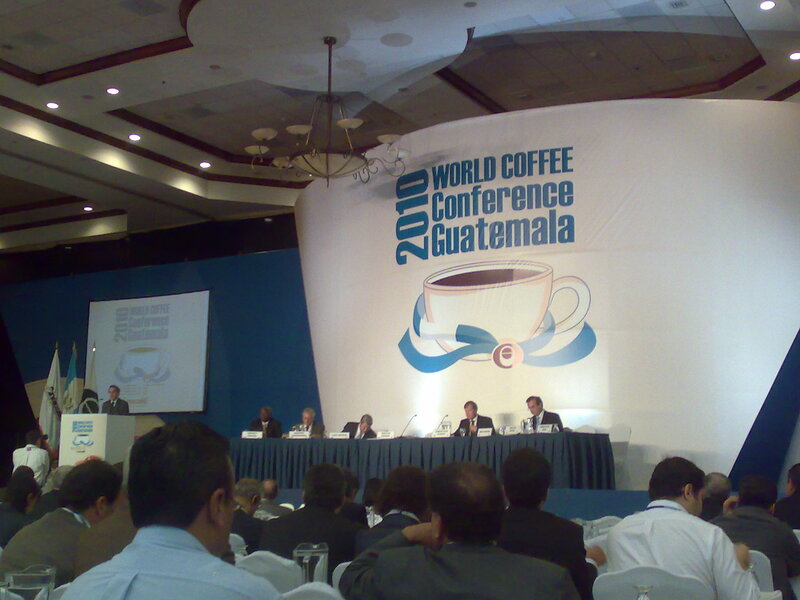 The really interesting one for me was on Colombian coffee, specifically the Juan Valdez brand. They made a big fuss about how successful promoting the “100% Colombian” brand, making people aware of Colombia as a coffee producer. Making who aware? The sales and demand figures were very impressive, but Juan Valdez doesn’t exist in the UK, and I think the vast majority of this ‘brand awareness’ comes from the US, where Juan and his donkey are everywhere. This was the first mention of geographical indicators, however, and appellation for coffee. Juan Valdez has started putting ‘Beantrack’ computers in their stores and on their website, allowing customers to see where the beans for that particular batch of coffee have actually come from. It’s a gimic, and the “Virtual Origin Tours” are very pretty but not the most informative. However, unlike every other large chain of coffee shops, they at least have some form of traceability. Furthermore, the idea behind the Beantrack is to promote the terroir of their different coffees. They are not just selling “Colombian” they are selling specific coffees from specific regions within Colombia – for instance, coffee from this particular area tastes like this, therefore its great for breakfast as a pick-me-up etc. etc. Simplistic, but still the beginnings of customer education and terroir. I like this. I see absolutely no reason why the region variations and differences in batches of coffee can’t be emphasised rather than blended in to oblivion. Daniele Giovannucci did a good talk on differentiation and certification, of which geographical indicators is a big part. He even said he needed more research into quality and differentiation. Woohoo! (Gimme a job?) This sort of thing has been done in the wine industry for centuries and it seems to work, both from the customer’s perspective as it gives more choice (I’m sorry Anna, but I am still gonna drink my South African pinotage, I am really not a fan of your beloved Italian!) and the producers: differentiation leads to scarcity, which bunps the price up – look at Jamaican Blue Mountain. There are already some relatively well known regional varieties – Kona coffee from Hawaii, Java coffee, Ethiopian Sidamo, and so on. Ethiopia produces a lot of different coffees as well as Sidamo, so it is that particular varietal which is popular. Colombia are trying to show there is more to their produce than just generic ‘Colombian’, and I’m sure Brazil and other big producers should be able to do the same. Over lunch, I met the Kaladi Brothers, who don’t appear to be brothers, but who run a roasting company and coffee shop in Denver. Really fun, down to earth blokes anyway: Andy and Mark. Mark is most definitely a coffee geek, and they roast and sell very high quality coffees which they source themselves. We got talking ‘geographical indicators’ and they said they used the region name in their packaging, because it makes a lot of marketing sense, even if they do make it a little more flamboyant. For example, they sell my beloved coffee from Cecocafen in Nicaragua, but instead of calling it “Matagalpan” (hardly catchy, admittedly) they borrow the name of the beneficio – Nicaraguan Solcafe coffee. Sounds good to me! Of course, a lot of what they do – and what I do with Doctor Coffee, is espresso based, and single origin coffees often aren’t suitable for espresso. Sometimes you need blends to make the espresso work. There wasn’t much talk of blending today, but plenty of varietals – and plenty of samples of varietals in the exhibition hall which I happily swigged. Mark was a bit sniffy about them. I bowed out about 10pm. I am soooo old! But I had an excellent night, I honestly couldn’t have eaten steak, and cheese was kicking rather violently. I knew if I stayed any longer, I wouldn’t have the energy for the next day! Well, we finally got there! I am more exhausted than I have ever been – well, than I have been since the last 48-hour-without-sleep trip to South America. It is mental exhaustion not just physical, although I had blissfully forgotten what standing on a market stall for nearly 9 hours in the cold does to your legs! The last week in the run up to Launch Day could not really have been more hectic, and I honestly begun to believe things were conspiring against me. First I failed my bike test, meaning that Carl is in charge of driving the Ape still – I still have no license. Extra ‘practice’ on a borrowed bike resulted in further confidence-shattering disaster – bruised ankles and bent handlebars. Then I found out that the Ape STILL wasn’t finished – the generator was still overheating, and the fans intended to cool it all down had still not been put in. Friday was a very saddening memorial service for a much missed friend and a trip to Sheffield, and then we were into The Last Weekend. Tom and Annie got married (YAY!) 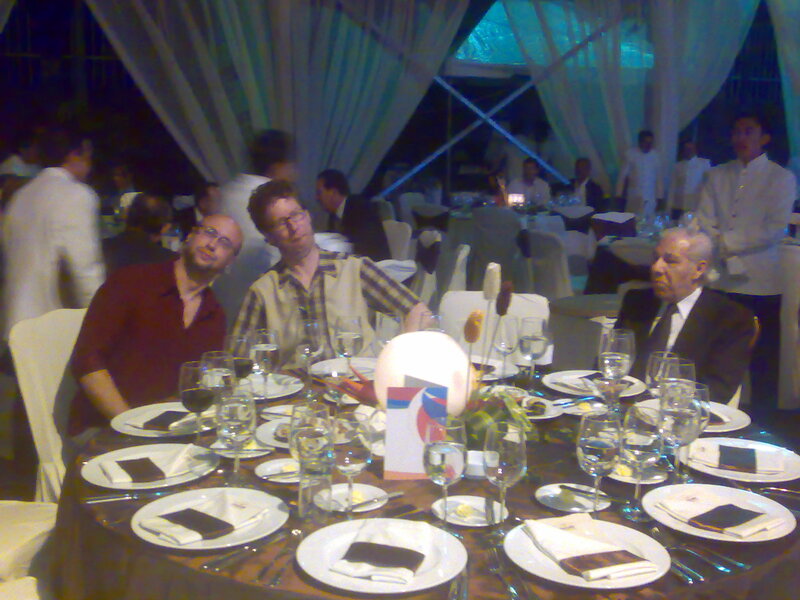 and I nearly ‘swooned’ dramatically during the speeches in what I can only imagine was an attack of nervous exhaustion. Sunday was spent with me feeling utterly terrible and unable to put my weight on my mysteriously swollen ankle (for once, nothing to do with drunken activities – swooning incident put paid to my drinking!) – BUT Jamie worked overtime and finally got our generator going at a temperature that didn’t make the fuel tank go pop. So we finally got the Ape home (Carl still describes the white-knuckle driving experience as a ‘learning curve’), practiced a few coffees for appreciative neighbours, discovered I’d completely lost the knack of foaming milk, Ape got stored in its own warm little nest of a garage, and we spent til 11.20pm frantically making sandwiches and baking cakes. With an inhumanely early start, Launch Day finally dawned. The lovely Carl stayed around all day to look after me as well as drive the 200 yards from the garage to the market square, (memo to self: I can probably push it, if all else fails!). One very reassuring thing was how easy the Ape is to set up. I do love my Ape. Genny gets fired up, cools the fridge, heats the espresso machine and while it is doing all that, I can grind some coffee and get the filter machine a-dripping. Everything else sits in nice little jars on shiny new shelves, and even the cash register can be folded neatly away in its own drawer. The genny is also very clever in that if we don’t need it running at full power, it doesn’t run at full power, so it gets quieter if it’s not being used. The only slight caveat is that the espresso machine is on a thermostat, and it took me most of the day to get used to the generator powering up seemingly at random as the coffee machine warmed itself up again. But overall, a happy little Ape. And we had a great day. My milk foaming skills returned, magically. It could have been better – it was Monday, and it was raining, and we would have done much much better if everyone who gave me/the ape strange looks actually bought coffee. But, as one Ape-admirer and coffee enthusiast pointed out that people need to get used to us being there. The Ape is distinctive, but if we keep going back week after week, hopefully we’ll get a following. Only one way to find out! We did get lots and lots of positive comments; I sold an uber-coffee to a total stranger who didn’t really know what he was buying, and even he was impressed! A guy from Drury coffee appeared as if from nowhere and gave me lots of free samples and offered his espresso machine repair service, if ever required. He also complemented me on my neat dry little coffee pucks, which did much for my ego. As ever, the cake disappeared pretty quickly. And big thank yous to all the wonderful supportive people (cake eaters) who came to visit me,or who sent me lovely good-luck messages. Jo and Graeme even brought me a little ape to go on top my grinder! So, having almost recovered from my tiredness, I am feeling good about Doctor Coffee’s. We finally got there! It feels like this has been such a long time coming, and it’s so exciting that its all finally happening! Worth all the stress, I think. 🙂 Now excuse me while I sleep until next Monday! Isn't is a cute little Ape? Coffee. Just Coffee. Not a pumpkin in sight.